Four comrades (three anarchists and one refugee) are in serious condition after the attack against the Themistokleous 58 squat in Athens, Greece. Support them! Read all our No Border reports; here. A few days ago we reported about the attack against the Themistokleous 58 squat in the Exarchia district in Athens, Greece. Four comrades were injured and are treated in hospital now. You can support Themistokleous 58 and the injured comrades by donating on a crowdfunding campaign. You can conate here or click at the picture at the left. 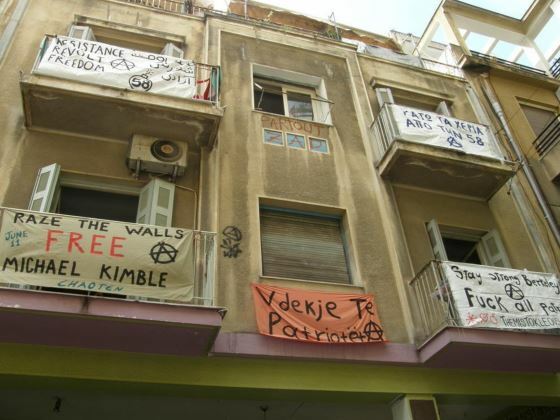 Themistokleous 58 is an Anarchist/Refugee squat and housing project for people with and without papers in Exarchia, Athens, Greece. On August 16th, 2017, Themistokleous 58 (TH58) was attacked in a fascist manner by mafia and recognized members of other squats, as well as people who sold tobacco and other substances near TH58. These people attacked with metal bars, wooden sticks, and knives, aiming for the heads of members from TH58 with intent to kill. As a result, four comrades (three anarchists and one refugee) are left in serious condition and hospitalized. Themistokleous 58 is always in need of financial support, but now more than ever during this troubling time. Some injured comrades will have lingering medical conditions that TH58 does not have the means to cope with alone. Let’s show solidarity for the comrades of Themistokleous 58, who have always shown solidarity for us!